Home / 20th Century Fox / animated movie / Ken Jeong / movie / movie trailer / trailer / Turbo / turbo 3d / Warner Bros. / Ken Jeong voices an elderly woman in Team "Turbo"
Ken Jeong voices an elderly woman in Team "Turbo"
In the 3D family comedy adventure “Turbo,” a snail learns that it takes more than talent to get to the top and that there’s no substitute for friends and family in the pursuit of a dream. It’s a lesson that the little snail at the heart of the new animated 3D film TURBO discovers when he sets out to become a champion racing driver. Turbo (Ryan Reynolds) has determination, drive and a sense of adventure but is an outsider within community of ordinary garden snails. He is dissatisfied with his lot; moving through life at a snail’s pace doesn’t suit his temperament. Turbo has an outlandish fantasy of traveling over 200 miles per hour – just like his hero, a champion French Canadian racing driver. It doesn’t sound possible for a creature known for being one of the slowest on Earth, but an accident on the freeway gives the little snail incredible speed. Turbo-charged, he embarks on a wild adventure in search of racing glory. Initially Turbo has no support at all. His goals are regarded with disdain by his brother Chet (Paul Giamatti), who thinks he should settle down and forget all about racing. Along the way he ends up with a group of racing snails in a rundown strip mall called Starlight Plaza. The humans whom he also met became an integral part of his journey who backed him up in doing the impossible – to race in the Indy 500. The leader of this group is Tito, who is co-owner, with his brother Angelo, of a struggling taco business they call Dos Bros Tacos. Tito’s true passion rests not with ground meat and tortillas, but with the snail races he hosts along with his fellow shop owners at the Starlight Plaza, as a means to gain exposure for their businesses. When Turbo zooms into Tito’s life at 200 miles per hour, Tito is inspired and the two kindred spirits head off to chase their impossible dreams. The senior member of the Starlight Plaza group is Kim Ly, a cantankerous and elderly nail salon owner who doesn’t mince words voiced by Ken Jeong (widely known for his character in “The Hangover” trilogy). Her expert manicurist skills come in handy when, as a member of Turbo’s pit crew, she paints, buffs and polishes Turbo’s racing shell. “Kim Ly is menacing, but mostly adorable,” says Jeong who’s anything but typecast as an elderly woman. “She has a little bit of a mean streak and can talk smack with the best of them.” Kim and the other shop owners bankroll Turbo’s trip to Indianapolis, hoping to cash in when he crosses the finish line. But by journey’s end, “she really cares about Turbo and the rest of the crew,” says Jeong. 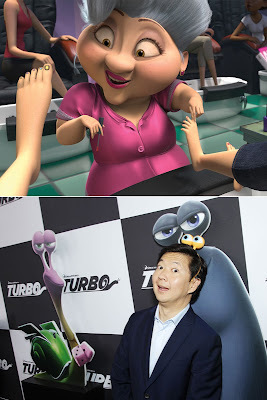 “TURBO” (in 3D and 2D) opens July 19 in theaters nationwide from 20th Century Fox to be distributed by Warner Bros.